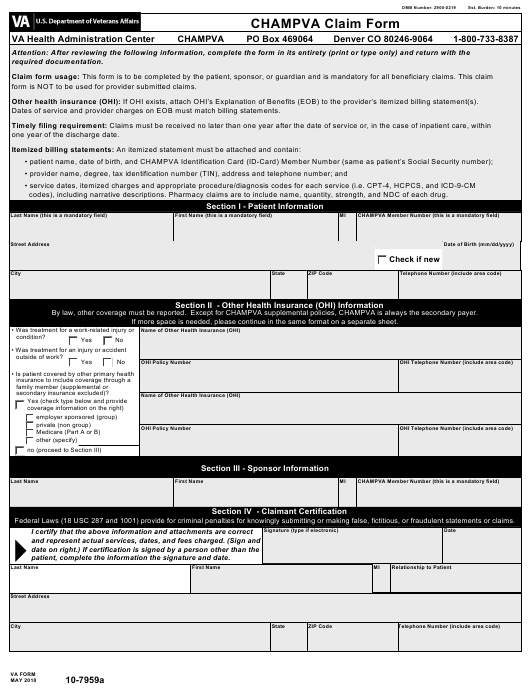 VA Form 10-7959a or the "Champva Claim Form" is a form issued by the United States Department of Veterans Affairs. The latest fillable PDF version of the VA 10-7959a was issued on May 1, 2010 and can be downloaded down below or found on the Veterans Affairs Forms website. form is NOT to be used for provider submitted claims. Other health insurance (OHI): If OHI exists, attach OHI’s Explanation of Benefits (EOB) to the provider’s itemized billing statement(s). Dates of service and provider charges on EOB must match billing statements. one year of the discharge date. codes), including narrative descriptions. Pharmacy claims are to include name, quantity, strength, and NDC of each drug. By law, other coverage must be reported. Except for CHAMPVA supplemental policies, CHAMPVA is always the secondary payer. If more space is needed, please continue in the same format on a separate sheet. Federal Laws (18 USC 287 and 1001) provide for criminal penalties for knowingly submitting or making false, fictitious, or fraudulent statements or claims. patient, complete the information the signature and date. CHAMPVA, ATTN: Eligibility Unit, PO Box 469028, Denver, CO 80246-9028 or call 1-800-733-8387. 38, U.S.C., and the Privacy Act of 1974 (5 U.S.C. 552a) or where required by other statute. and maintaining the data needed and completing and reviewing the collection of information. calling the CHAMPVA Help Line, 1-800-733-8387.